Quick Sound Selection for every part - your most favorite sounds are just one fingertip away. Transpose your patterns and step sequences with the attached keyboard. There is only one thing, we left untouched in our new design - the sound engine. Still the warmest and richest sound out there with the power of a modular synthesizer in a box. 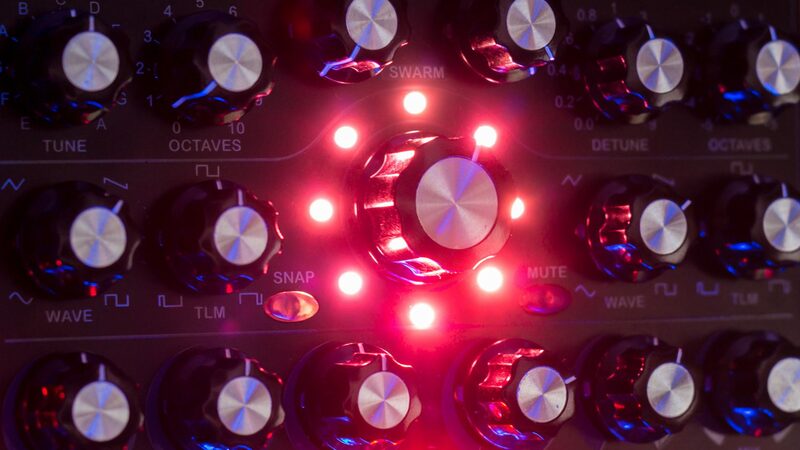 The way players can interact with the destinc-tive user interface makes the Spectralis 2 hybrid synthesizer a killer live instrument with unbeatable richness and stunning flexibility. The synthesis engine takes advantage of a sophisticated step sequencing system - 32 independent parameter control lines with up to 192 steps let you explore an universe of previously unheard rhythmic effects and atmospheric textures. Punchy high resolution envelopes, are the cutting edge of todays synthesizer technology. They are the perfect weapon for the creation of floor pounding kicks, state of the art sequencer staccatos and numerous percussion effects. Rumbling noises, nasal sounding oboes, booming SciFi-drones and vocaloid solo-voices - all these different sounds have one thing in common - the fixed filterbank. Consisting of 8 bandpasses, one lowpass and one highpass filter, the filterbank allows the selective modification of certain frequencies. The spectrum of the sound is divided into separated frequency bands where each resulting spectrum slice has an individual attentuator. Like the instrument corpus forms the frequency response of an acoustic instrument, the fixed filter bank provides a new approach in the creation of realistic instrument timbres and bizarre FX-sounds. In contrast to big modular systems of the past, where the filterbank had fixed filter response curves and simple pots to regulate the levels of the frequency slices, the Spectralis 2 comes with sequencer controlled level modulation and in depth parameter editing like individual frequency band panning, Q and roll off slope control and filter stage spacing. The usage of the fixed filterbank is not limited to hybridsynth voices - simply feed any DSP synth part thru the filterbank or even any external signals from the external analog inputs. The Spectralis 2 step sequencer comes with step envelopes, where normal step-sequencers only offer a fixed value setting per step. In conjunction with the filterbank, these step envelopes allow for instance the creation of a new drum beat by simply feeding noise into the filterbank and programming some decay steps for selected frequency slices. In contrast to many other groove oriented sampling instruments, the Spectralis 2 offers real multisampling and a 32 stereo voice polyphonic sound engine with powerful subtractive synthesis capabilities. Lush strings ensembles, dramatic soundscapes or earthshaking drum grooves - simply drag and drop the highlights of your personal soundlibrary from your computer onto the Spectralis 2. The highspeed USB2 interface transfers even large sample instruments in a few seconds. An included sample conversion utility allows importing wav- and soundfont2-files. After finalizing your music production, the entire song content with patterns, sounds and samples can be stored back to the computers harddrive. Satisfied with the backup functionality but still wondering about the LIVE situation? Do not worry about that! The Spectralis 2 comes with a SD-Card slot and has an onboard 1GB flash memory (expandable up to 2GB) for permanent storage of samples, songs and sounds. Features are only one side of the story - but realizing them with the latest Texas Instruments floating point DSP generation and featuring HiEnd Burr Brown DA converters gives the Spectralis 2 the no compromise touch of a groundbreaking new star in the sonic wonderland of electronic music instruments. As a groove oriented system the Spectralis 2 features a powerful pattern based sequencer playground with realtime and step by step recording as well as grid based drum programming. Additionally, the state of the art step sequencer opens a complete new universe of tempo dependent sound manipulations and freaky polyrhythmic sequencer battles. Designed with the live situation in mind, you will enjoy the absolute freedom of realtime manipulations during your session. Mute/unmute tracks, exchange the motifs on the fly, tweak volumes, panning or FX-sends with the built in mixing console or transpose an entire pattern by simply pressing a note on your keyboard. Editing of sequences can be done without stopping the sequencer - one of the most desirable features in todays groove oriented live instruments. Start your session with a simple basic groove and add steps on the fly until the audience is totally freaked out. Are you into more serious music production? Well, the Spectralis 2 also comes with a song section, where you can arrange the patterns to complete songs.